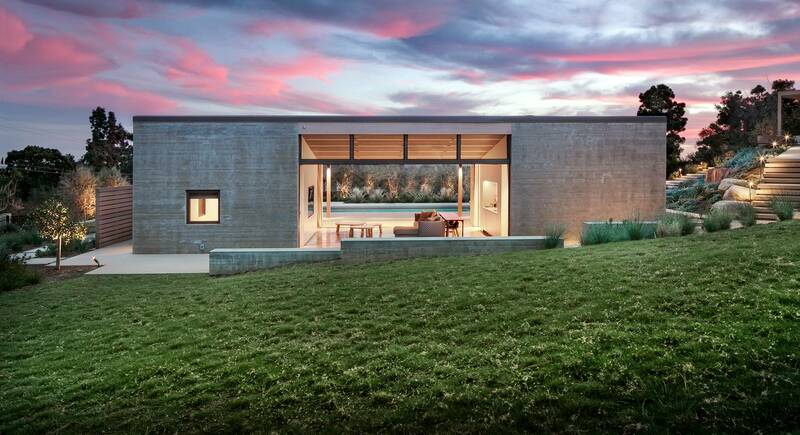 "There’s something about the pool house typology that is inherently Californian. It might be the open spaces and water element that it implies, or perhaps the low scale, single-storey structure that often references modernist gems, such as the region’s iconic Case Study Houses of the 1950s and 1960s. Either way, the pool/guest house genre often conjures up images of lazy Californian afternoons and elegant Slim Aarons-style pool parties; which is exactly what this new completion by New York-based Gluckman Tang brings to mind. The stylish guesthouse, which also serves as a pool house, has been recently completed in La Jolla, California, as part of the grounds of a larger spec residence. Elegant and small-scale, the building features strong geometry and clean, minimalist lines, which make for suitably subtle drama and confident architecture. Board-formed concrete on the outside creates a warm, tactile feel and visually links the guest house to the main house’s stuccoed facade."